For the majority of modern dog owners, choosing the right dog trainer is one of the most important decisions they will have to make regarding their dog. Unfortunately, it can also be one of the most difficult decisions to get right. Assuming you have already determined that you need the help of a trained professional to guide you and your dog , you will very likely be faced with a virtual armada of people claiming to be the only dog trainers in the world who hold the key to lifelong obedience and happiness. Many offer guarantees (more on that later), some claim to be zen-like coaches ready to help you become your dog's 'pack leader' (red alert! ), and others charge more per hour than trained human psychologists (don't be fooled). So how do you navigate through this minefield of options and emerge with a truly qualified positive trainer who will work with you and your dog using modern, force-free, science-based tools and techniques? To answer this correctly, we need to back up to the first step in the decision-making process: do you need a dog trainer in the first place? Do I Really Need a Dog Trainer? Good dog trainers often find themselves in the awkward position of having to justify their chosen profession, because to at least some degree, everyone thinks they're a dog trainer. A commonly-heard refrain among dog owners is that "no one knows my dog like I do." While that may very well be the case, it's not really relevant to whether or not that makes them the right choice to make dog training decisions. While many dog owners might be proficient handlers, qualified dog trainers do possess a skillset and information which they have worked very hard to master, and the gap between a well-meaning, intelligent dog owner and a trained professional is wider than many sometimes believe. While it is certainly possible to read some books or browse websites such as this one and come away with a good amount of knowledge about how dogs think, feel and learn, it does still take a qualified trainer to fully point dog/owner teams in the right direction and help them get back on track when facing behavioral issues. For the vast majority of pet parents, there comes a point relatively quickly in the development process of building a healthy dog/human relationship when they need a dog trainer to guide them away from common pitfalls and towards a lifetime of mutual enrichment and harmonious balance. The simple fact is that most people can't do it alone and need the help of a trainer. Those who are reticent to hire a dog trainer sometimes resist due to a feeling that their money would be better spent on other dog-related products or activities. In most cases, however, the financial investment in positive professional dog training services early in a dog's life almost always saves time, effort, money and sometimes even heartache in the long run. As is the case with all good training techniques, the sooner you develop essential communication skills and behavioral building blocks, the less likely you'll be to encounter serious behavior issues you can't manage. Although there are many dog training organizations, schools and associations, dog training remains an unregulated profession. Anyone can 'hang their shingle' and claim to be a dog trainer regardless of the type or level of education or experience in the field. In addition to creating a glut of under-qualified and inexperienced 'professionals', this lack of regulation also leaves the door open for people who practice outdated and dangerous dog training methods to be classed alongside truly gifted positive trainers. 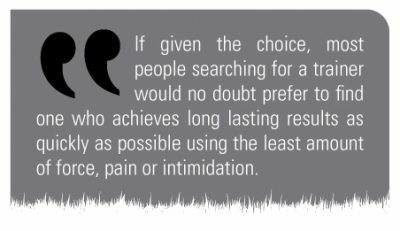 If given the choice, most people searching for a trainer would no doubt prefer to find one who achieves long lasting results as quickly as possible using the least amount of force, pain or intimidation possible. The problem is that due to a combination of clever marketing from old-school traditional trainers and an understandable lack of behavioral scientific terminology and expectations, those well-meaning clients-to-be are frequently duped into hiring dog trainers who prey on their ignorance about the unregulated and confusing quagmire that is the professional dog training pool. If the end result of this deception were the harmless equivalent of choosing an ice cream flavor you didn't like, that would be fine. Unfortunately, however, choosing the wrong dog trainer can have disastrous, sometimes even fatal results. 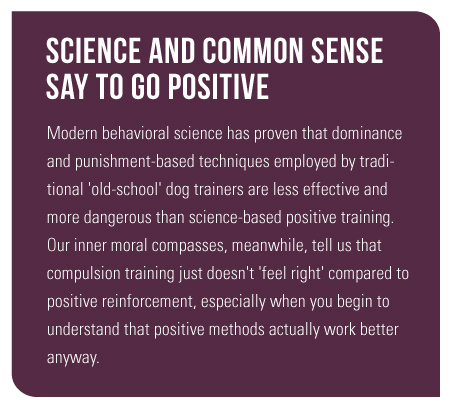 Over the past few decades, the dog training profession at large has made huge strides towards positive training ideologies thanks largely to advances made in modern behavioral science. Positive trainers like Victoria have slowly but steadily begun to turn the public consciousness about how we can and should treat our dogs into the 21st century, similar to the enlightenment surrounding the guiding principles behind how we raise children now as compared to 50 years ago. 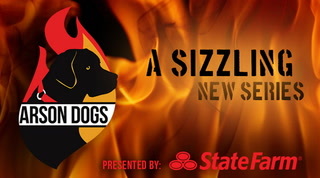 But this renaissance in the dog training world has necessarily come at the expense of traditional dog trainers who continue to cling to outdated and since-disproven theories about pack leadership, dominance, and the value of punishment, especially with so-called 'red-zone' dogs. These trainers have seen their profit margins and very livelihoods threatened by the steady advance of positive training and the growing awareness among their client bases that there is a better way to train… Positively. As a result, punishment trainers have begun to cleverly adapt to the marketplace and now regularly and misleadingly include popular positive 'buzzwords' and key phrases into their marketing efforts and recruitment conversations with potential clients. The clear effect of this misdirection campaign has been to muddy the playing field among training professionals to the point where it is now difficult even for those who know exactly who and what to avoid to identify which trainers are legitimately reward-based positive trainers. What Is a Positive Trainer? Before conducting a search for a positive trainer, it is important to define just exactly what a positive trainer really is. 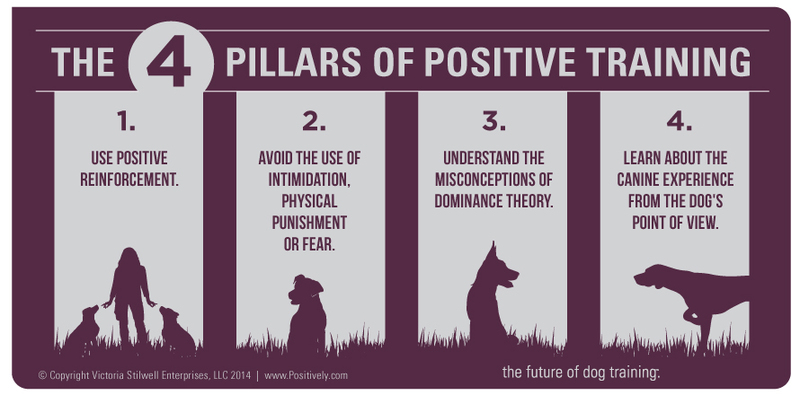 The phrase 'positive training' isn't actually a scientific term, and therefore it is important to understand that for the purposes of finding a good trainer, when we refer to 'positive training' we are talking about someone who promotes Victoria's 'Four Pillars of Positive Training'. What Makes a Good Positive Trainer? But being a positive trainer is only part of the equation. You might be the most enlightened, forward-thinking trainer in the world, but if you don't have good communication and people skills, you won't be a very effective... Not all positive trainers are created equal, and in fact those that are not particularly gifted actually give positive training as a whole a bad name. A good trainer is a great listener and should be interested in your take on your dog's characteristics, tendencies, personal history, strengths and weaknesses. Rather than swooping into a situation and immediately dictating who and what needs to change, good trainers start by sitting down and talking through expectations, concerns and philosophies before starting any actual training or behavior modification work. Be a VSPDT trainer. All trainers who are members of the global Victoria Stilwell Positively Dog Training (VSPDT) network are world-class positive trainers who have been vetted and personally approved by Victoria and her team. VSPDT's are among the best positive dog trainers in the world and should be your first choice when searching for a dog trainer. Have good people skills. It is imperative that any good trainer be a great communicator both in terms of listening to your questions and concerns as well teaching you and your dog. They should be very easy to understand and able to pace their teaching style to whatever speed you need in order to produce positive change. Be a great listener. This is crucial. You can usually tell during your first contact with a trainer – via email, phone or in person – whether he or she is willing to take the time to hear what you have to say. If you're not able to communicate effectively with the trainer, the process will be infinitely more challenging from the start. Use positive methods to address negative behaviors. Anyone can teach a dog to sit, stay or come using positive reinforcement, but it takes a lot more skill, experience and confidence in positive training techniques to modify unwanted negative behaviors like aggression or separation anxiety using positive training. This is a key identifier which separates hybrid trainers (that use both positive and punishment techniques) from truly great positive trainers. Take a full behavioral history of your dog. Good trainers want to know everything possible about a dog's background so that they can more quickly and effectively identify root causes and implement a positive training protocol. Any trainer that discounts the importance of a dog's history should be avoided. Provide client references. In fact, a good trainer will usually actively want you to talk to his or her previous clients. This is because there are so many bad trainers working professionally, it is even more important for the good trainers to convince you that they are in fact solid positive trainers. While it's good to talk to references from the trainer's list, he or she should also encourage you to find and talk to previous clients on your own. Good trainers have nothing to hide. Want to train the entire household. Consistency is a key to effective positive training, so good trainers will usually strongly suggest that if at all possible the entire household be available for at least the early training sessions. Doing so ensures that everyone who interacts with the dog will be using a common language and providing a consistent learning experience for the dog(s). Have liability insurance. This is a business term, but an important thing to confirm before hiring a trainer. Not only does it suggest a higher level of professionalism and legitimacy, it also protects you and the trainer in case anything goes wrong with the dog. Include you in the training. During the training process, a good trainer will constantly and effectively communicate what he or she is doing, and one of their primary goals will be for you to step in and eventually take over the actual training with your dog. Always remember, you are your dog's primary trainer whether you like it or not: your dog is constantly observing and learning – not just when you're actively training him. Every interaction you have with your dog constitutes some degree of training – you're providing experiences and responding with some type of reward or punishment based on your behavior. Dogs learn from every experience, so it's your responsibility to ensure that you work with people you trust to help you learn to guide your dog into making the right choices. When deciding which dog trainer to hire, there are specific red flags you may encounter which should be considered immediate justification for avoiding those trainers at all costs. No matter who recommended them, no matter what your vet tells you, no matter how great their reputation is in your area, trainers who say and do the things on the list below should not be allowed anywhere near your dog. Use of phrase 'Pack Leader'. For many, this may seem like a strange thing to consider a problem, but the fact is that the use of this phrase almost always reveals a much wider common lack of understanding about dog behavior. Of course we should provide leadership to our dogs, but given the recent debates within the dog training world over the misunderstandings of pack theory and dominance, those who still use this phrase in dog training are almost always traditional, old-school trainers, even if they may not know or admit it themselves. Suggestion that your dog is being 'dominant'. Again, given how much misinformation popular media has injected into the public consciousness, this may seem like a harmless, even accurate, diagnosis. Dominance is such a widely misunderstood concept, however, that it is almost religiously used by punitive trainers as a catch-all root of nearly every behavior problem imaginable. The truth is quite different, however, and a misdiagnosis of 'dominance' as your dog's problem almost inevitably leads to an incorrect prescription – one that frequently causes more harm than good. Use of shock, prong or choke collars or electric fences. If your trainer suggests you use one of these punishment-based devices, grab your dog, run away and don't look back. It's simple: these tools have been proven by science to be less effective and cause more damage than positive training tools and techniques. Combine that with a positive trainer’s instinctive awareness that they would rather teach dogs without the use of pain, fear and intimidation, and the choice is clear. And don't fall for it when people say these things don't hurt dogs – they absolutely do. Use of techniques like 'alpha rolls', kicking or 'poking' dogs, leash jerks or physical punishment of any kind. Any trainer who uses these techniques is an old-school trainer who continues to use punishment instead of positive reinforcement even though heavy-handed techniques have been proven to be less effective, more dangerous and less humane. Don't believe it when they tell you it's how mother dogs correct their young (you’re a human, not a mother dog!) or that bigger, older dogs need a heavier hand to teach them who's boss – positive training works on all dogs regardless of breed, age or drive and all behaviors, so there's never a need to physically punish your dog. Positive trainers will provide alternative non-physical (but even more effective) humane discipline like removal of good things, time-outs and withholding of rewards. Client references that mention the above points. Be on the lookout for clever dominance and punishment trainers who say one thing and do another. They (usually) can't control what their clients say, however, so if you hear a previous client mention how the trainer used the above philosophies, tools and techniques, avoid that trainer at all costs. A trainer without references. Like all solid businesses, a good trainer will have a long list of references available for you to talk to. If the trainer resists letting you talk to previous clients, you have all the information you need to move on. If possible, don't just rely on a list of references provided by the trainer – try to find some previous clients that he or she may not want you to talk to. Try to find a large enough sample size of references – there are likely to be one or two bad apples in everyone's work history. Anyone that offers guarantees. Despite what some popular dog training companies say, there are no guarantees in dog training. Like humans, dogs are instinctive animals that can never be 100% predictable, so there's always a chance that unwanted behavior may resurface. Any trainer offering a guarantee regarding dog training either doesn't understand dog behavior, is only concerned about making money, or both. A trainer who doesn't want to hear your dog's history. In order to successfully address a dog behavior problem, one must first fully understand the factors behind the behavior. The only way to begin to understand why a dog is behaving a certain way is to gather as much history of the dog and his behavior as possible. Any trainer who discounts everything that happened before he or she arrived does not truly understand dog behavior. Most people choose their dog trainer based on either a personal recommendation from friends or because they appear to be well-qualified. While it is certainly valuable to hear that a certain dog trainer really helped solve problems for your neighbor, there is still work to be done to determine if that trainer is the best fit for you and your dog. Similarly, although a trainer may have a lot of impressive-looking letters after his or her name, they may not necessarily be the best trainer for what you need. So how do you sift through the available information to determine which trainer to hire? Veterinarians often have a 'go-to' trainer or two on their speed dial and will sometimes enthusiastically recommend that you work with whoever they suggest. Sometimes these recommendations are indeed your best option, but it is wise to do your research about the trainer without simply taking your vet's word for it. Traditionally, most veterinary schools focus almost exclusively on medical training but do not teach as much regarding the behavioral side. This leaves a sizable information gap within the veterinary community, and even though vet schools are including more information about behavioral science into their curricula, it is generally safest not to assume that your vet is necessarily as savvy about your pet's behavior as he or she probably is about Fido's vaccination schedule. Take your veterinarian's suggested dog trainer into consideration, but try to 'comparison shop' and use the tips above to find the best positive trainer in your area. There are also many dog training schools and associations which gather professional dog trainers under various umbrellas, sometimes for the purpose of marketing them to potential clients more effectively. Some of these institutions claim to collectively profess allegiance to a particular training philosophy while others require their membership to adhere to varying degrees of an application process. Others do not require anything other than your name and a valid checkbook to become a member. 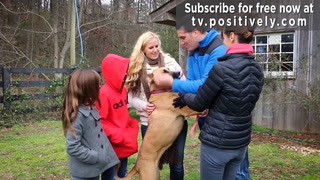 While most of these organizations have the dog-owning public's best interest at heart, and some do great work promoting various philosophies and initiatives, it is dangerous to assume that just because a dog trainer is a member of a specific organization or a graduate of a particular school that they are necessarily a great positive trainer. Even if an organization is known as a positive training-centered institution, very few of these groups actually follow up with their membership and provide accountability to ensure their trainers continue to grow and practice as truly positive trainers. 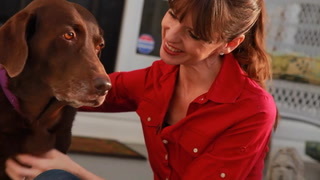 An exception is the brand new Victoria Stilwell Academy for Dog Training and Behavior. Graduates from this new school for aspiring dog trainers will have received extensive classroom education and hands-on training to ensure that they are well-prepared to help you with your dog's training needs. Be aware of the qualifications and associations of your dog trainer, but do not put too much stock in the letters after his or her name and certainly do not hire a trainer based solely on his or her qualifications. Having recognized the sometimes confounding nature of the professional dog training landscape, in 2010 Victoria founded a one-of-its-kind global network of world-class positive trainers under the name Victoria Stilwell Positively Dog Training (VSPDT). Tired of witnessing firsthand and hearing countless stories of untold damage being done to unsuspecting dog owners and their dogs due to experiences with punitive trainers who claimed to use positive reinforcement, Victoria created VSPDT to provide the dog owning public with an option which could be trusted to provide the highest quality positive dog training services. By affixing her name publicly with great trainers around the world, Victoria is making a commitment to ensuring that VSPDT trainers will practice the most humane, effective, scientifically-based positive dog training methods available. Each VSPDT trainer undergoes an extensive application process which includes rigorous tests of dog behavior knowledge and experience levels, client and business reference checks, hands-on dog training experience and business background checks. Each applicant is personally vetted and verified by Victoria herself before being granted a license. In addition to implementing the dog training industry's most stringent application process, VSPDT also leads the field in ensuring its trainers maintain levels of professionalism and a commitment to positive training on an ongoing basis after they have been accepted onto the VSPDT team. 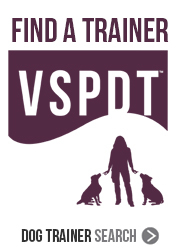 The VSPDT network is constantly growing in number, but if you happen to not live near a VSPDT trainer, Victoria has launched the VSPDT Phone Consultation Program, where dog owners from anywhere in the world can directly contact a VSPDT trainer by phone or Skype. VSPDT is the industry leader in the dog training field, so when you need a dog trainer you can trust to employ positive methods and provide guidance for you and your dog, you can rest assured that Victoria and her team have done the vast majority of the vetting process for you. Find a VSPDT trainer near you. "How do you correct behavior?" The type of answer a dog trainer gives to this question can tell you a huge amount about what kind of trainer they are. If the answer involves physical punishment of any kind, you can cross that trainer off your list. What you're looking for here is a description of techniques which interrupt the behavior without force or intimidation followed by an immediate redirection of the dog onto other more positive things. "Can I speak to your past and current clients?" Any trainer who resists letting you talk to past and current references has something to hide and should not be trusted. Be sure to take the references with the appropriate grain of salt, but if you hear even one previous client say the trainer helped them become a better 'pack leader' and show 'dominance' over the dog, avoid that trainer at all costs. "Do you have liability insurance?" All good trainers should carry insurance. "Are you a dog whisperer?" The answer given here will also tell you an awful lot about the type of trainer you're dealing with. The term 'dog whisperer' has become a hot-button issue in the dog training world, and while there is nothing wrong with the term in general, it has unfortunately become synonymous with certain dominance and punishment-based techniques which are correctly avoided by good positive trainers. "How might medical issues affect my dog's behavior?" Good dog trainers want to work in harmony with solid veterinary care to first rule out any potential medical issues when identifying the root causes of any unwanted behavior. If the trainer discounts the importance of the veterinary component of dog behavior, you should avoid that trainer. "Might my food be affecting my dog's behavior?" The simple answer to this question should be "yes", so any trainer who discounts the importance of nutrition on behavior should be avoided. "Do you use rewards in training, and if so, what kind?" This is sort of a trick question (on purpose). Some old-school trainers are vehemently against positive training and can't help but reveal their ignorance when asked about rewards in training. Such a response should be all you need to hear. But if the response is more nuanced, saying that the trainer does use some rewards but not food, that's another area for concern. Food is very powerful in changing a dog's brain chemistry, and anyone who rules out the use of food in training is not using up-to-date information. The answer you're looking for is that yes, rewards are crucial in training, and that they like to use whatever reward motivates that particular dog the most (food, praise, play, toys, etc). Finding a dog trainer can be daunting, but by knowing which questions to ask, staying aware of red flags to avoid and harnessing the power of Victoria's VSPDT network, dog owners can navigate the often treacherous path and end up with a positive trainer they can trust. Ultimately, every dog deserves a dog trainer who helps guide the dog/human team to make the right choices by employing the power of positive training. No longer do owners need to settle for trainers, training tools and techniques which utilize force, fear, pain and intimidation instead of mutual trust and respect. The New VSPDT Phone Consultation Program - Talk to a VSPDT Trainer!